Rice University researchers and their collaborators at North Carolina State University have recently tested their nanocars in open air, i.e., in ambient conditions instead of vacuum. What they found was these hydrophobic single-molecule cars became unsafe upon exposure to open air by getting stuck to the “road,” thus creating large speed bumps. The first nanocars were developed by the Rice team. The study results have been reported in Journal of Physical Chemistry C, a journal from the American Chemical Society. Rice University prepares to participate in the first NanoCar Race that is going to happen in Toulouse, France, in October. The Rice Scientists are part of one of five international research teams that are planning to participate in the competition. The recent tests by Rice chemist James Tour, NC State analytical chemist Gufeng Wang and their colleagues were part of this effort. Driving conditions stand as an important factor for moving cars, just the way it is important in the macro world. Rice researchers are trying to test the performance of their nanocars in a natural setting, although the race is going to happen in an ultra-cold vacuum. Our long-term goal is to make nanomachines that operate in ambient environments. That’s when they will show potential to become useful tools for medicine and bottom-up manufacturing. Adamantane wheels are incorporated into the latest model of nanocars. These wheels are little hydrophobic (water-repellent) in nature as nanocars can be kept attached to the surface only through hydrophibicity. Adding to it, Tour also said that too much of hydrophobicity can permanently immobilize the cars. This is because things that are hydrophobic in nature have the tendency of sticking together, thus reducing the amount of surface area exposed to water. Whereas, Tour said that hydrophilic or water-liking particles have the tendency to float freely in water. In nanocar research, the most commonly used substrate is glass. In the latest test, the nanocars featuring adamantane wheels were positioned on either polymer polyethylene glycol (PEG)-coated glass or clean glass. The anti-fouling and non-sticky characteristics of PEG-coated glass slides were the reasons for their use. They hydrogen peroxide treatment made the clean glass slides non-sticky, thus preventing the hydrophobic wheels from sticking. Tour said that the cars were not driven much as they had undergone “directed diffusion” in the tests. The main objective of the test was to understand the potential energy surface interaction between the vehicle and surface over time better, and to also identify the kinetics of nanocar movement. We want to know what makes a nanocar ‘hit the brakes’ and how much external energy we need to apply to start it moving again. Every nanocar is a single and complex molecule, which consists of only a few hundred atoms. Hence, any molecule that hinders their movement will act as a huge obstacle that behaves like sticky foam. So, with every collision, the molecular car slows down, and at one point, it gets stuck permanently. According to Wang, when looked upon from an energy perspective, i.e., the energetic relationship between the nanocars and the molecules that form the road, many potential energy walls are generated by the molecules adsorbed from the atmosphere similar to puddles present in the potential energy surface. 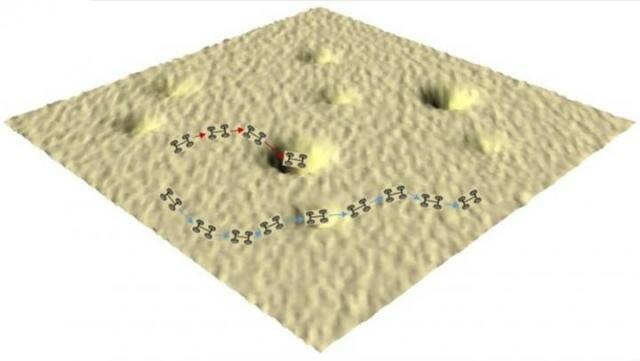 The molecular cars can be slowed down or permanently trapped by these puddles. The test results revealed that the number of cars that seemed to be moved on the nonsticking PEG slides was nearly double than those moved on the bare glass. Moreover, the rate of movement was slightly higher for all the cars when compared to the clean glass. It was observed by the researchers that, the new nanocar models were not able to be viewed using scanning tunneling microscopes. This is because, scanning tunneling microscopes work in vacuum and they also emit energy that has the tendency to disturb the car movements. Hence, the researchers used confocal microscopes to track the car movements by tagging each molecular vehicle with a fluorescent marker. The paper was co-authored by graduate students Victor Garcia-López and Pin-Lei Chu of Rice and graduate students Fang Chen and Tao Jin and postdoctoral scholar Bhanu Neupane of North Carolina State. Wang is an assistant professor of analytical chemistry at North Carolina State. Tour is the T.T. and W.F. Chao Chair in Chemistry as well as a professor of computer science and of materials science and nanoengineering at Rice. The research was supported by the National Science Foundation and North Carolina State University.